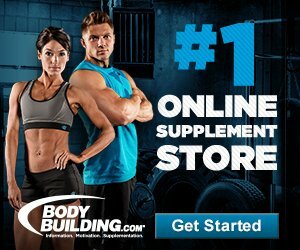 Comprehensive review of Protein World The Slender Blend. See what real experts and actual users have to say about this protein powder. Protein World The Slender Blend gets a 4 out of 5 star rating. This protein powder can be used for a number of different things such as a meal replacement, aiding in weight loss, and building lean muscle/toning up. It’s very versatile and can be used by both men and women. It uses fast and slow absorbing proteins that may help extend protein synthesis and aid in muscle recovery. It has 24 grams of protein, which may aid in muscle growth and also curbing hunger and cravings. The taste is delicious and it easily whips up into a creamy, yummy shake that I actually look forward to drinking. There’s also a thermogenic blend to help rev the metabolism and burn fat. It has a vitamin and mineral blend to support healthy immune function and healthy skin, hair, and nails. Protein World definitely goes the extra mile to produce a quality product. I really appreciate it because it’s gluten free, soy free, non-GMO, vegetarian, kosher, and free of artificial colors. I felt great the entire time I was taking this protein shake. I definitely felt full for longer and didn’t have as many cravings during the day. It also gave me a bit more energy for my workouts because it contains caffeine. This could be a great addition to your daily routine if you’re looking to lose weight or build lean muscle. The Slender Blend is really easy to use. It mixes up in a pinch, the only potential hassle is that you have to use 4 scoops. However, the 4 smaller scoops are almost easier to navigate than one giant scoop because it’s a little less messy. Just take 4 scoops and mix with 13.5 ounces of water or milk of your choice. I used a shaker cup and it blended up in about 10 seconds. The result was a nice, smooth, creamy shake that didn’t have any grit or chunks! I tried this protein powder in the Banana flavor. It’s really creamy yet refreshing. You can really taste the banana in it and it’s not overwhelmingly sweet, which is a plus for a lot of people. I’m definitely a fan of this flavor. I mixed it with unsweetened almond milk and it was delicious every time. Breaking down the macros, this protein powder has 24 grams of protein, 1.5 grams of fat, and 8.2 grams of carbs per serving. This combo can be beneficial for those wanting to build/tone muscle and lose weight. Each serving is 4 scoops and has 141 calories. The Slender Blend has quite a bit going on in the ingredients category. First and foremost, the protein sources are Whey Protein Concentrate and Skimmed Milk Powder. Both protein sources have a full range of amino acids that may really help with protein synthesis and muscle recovery. However, the whey protein is considered a “fast” protein because it’s quickly absorbed in the body. The skimmed milk powder is considered a “slow” protein and it’s made up mostly of casein, which takes longer for the body to absorb. There’s also a thermogenic blend including: Guarana Extract (22% caffeine) & Green Tea Extract (40% polyphenols). So this protein shake contains 24mg of caffeine per serving (4 scoops). These 2 ingredients are used to help boost metabolism and burn fat. It also has a great vitamin and mineral blend to support normal immune function and promote healthy skin, hair, and nails. The vitamins and minerals include: Vitamins A, D3, E, K, C, B1, B2, B3, B6, B9, B12, Biotin, Pantothenic Acid, Potassium, Chloride, Calcium, Magnesium, Iron, Zinc, Copper, Manganese, Selenium, Chromium, Molybdenum, and Iodine. All of the ingredients are kosher, soy free, gluten free, vegetarian, halal, and suitable for diabetics. They’re also non-GMO and free of artificial colorings. I’m so happy because I didn’t have any side effects while taking this protein powder. Sometimes I notice belly pain or bloating with certain protein shakes, but not with this one! I felt full, energized, and ready to go. Speaking of energized, it does contain caffeine. So just plan accordingly and don’t take it right before you want to crash out for the night. It also contains milk, since the protein sources are from whey and milk powder. Once I was done testing out The Slender Blend, I think it’s best used for aiding in weight loss, toning up, and as a meal replacement. It has a lot of great qualities that may really be beneficial. It has 24 grams of protein, which goes a long way for muscle growth and recovery. The protein content also keeps you feeling full for longer. There’s a thermogenic blend to boost weight loss, as well as a vitamin and mineral blend. The price of a 2.6 lb. container is $48.00. There are 30 servings or about a month’s worth included in this. This works out to 6.66 cents per gram of protein. That’s actually really reasonable and even a bit cheaper than average. I think it’s a great price for the value, especially considering it can be used as a high protein meal replacement for both men and women. Protein World has a guarantee but it’s a pitiful one at that. They offer a 14-day money back guarantee, however the item must be unopened. This really doesn’t qualify as a guarantee to me because you don’t even get to try the product. It was a nice gesture on their part but I really wish they would let you get your money back on a product after trying it. 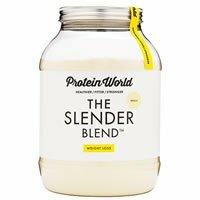 To buy Protein World The Slender Blend, click here.